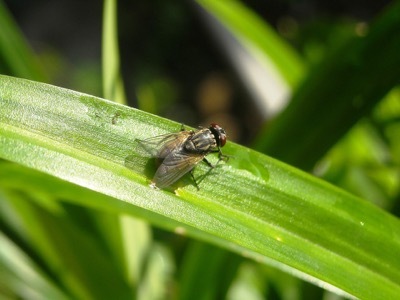 There are three main types of fly in Singapore: the regular housefly (Musca domestica), the bluebottle fly (chrysomya megacephala) and the flesh fly (boellcherisca peregrine). The regular housefly goes through four life stages but is best known for its distinctive adult appearance. It is roughly 6mm to 7mm long with larger females than males. They have large, reddish-brown eyes with four black stripes along their abdomen and translucent wings. The bluebottle fly is a type of blow fly characterized by the bright, metallic blue of its abdomen. It is roughly 10mm-14mm and has a grey head. 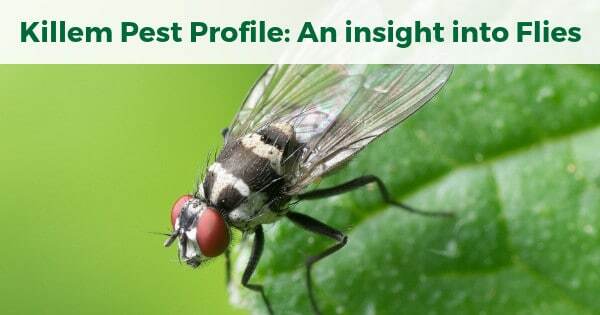 The flesh fly has green and black stripes down its abdomen, large red eyes, and deposits live maggots as offspring rather than small white eggs. All three of the flies undergo similar lifecycles. The regular housefly and the bluebottle fly begins as eggs before evolving into maggots, while the flesh fly will deposit maggots directly. All flies will leave their offspring on decaying organic matter like garbage, feces, or old meat. The offspring will thing feed on the material as maggots and pupae before becoming fully grown. Adult bluebottle flies are great pollinators and eat nectar while helping flowers thrive. The housefly usually eats liquids or materials softened by its saliva, and can thus feed on many materials or human food sources. The flesh fly is known for eating decaying flesh and is usually found around meat. Many households and companies should take great care to keep meat covered to prevent contamination. Since flies travel to many areas and feed on a variety of materials, they carry numerous diseases. Contamination is a common threat because flies can carry bacteria on their bodies or deposit it by leaving their feces on food sources. The regular housefly hosts a wide variety of illnesses: typhoid, cholera, dysentery, and viral hepatitis A and E. Bluebottle flies can carry typhoid, dysentery, anthrax, tuberculosis, and the bacteria which causes strep throat. Finally, the flesh fly is known to carry the bacteria which causes leprosy, can cause parasitic myiasis, and has been known to give humans and animals blood poisoning. All flies can transmit E. coli and salmonella to people through food. In Singapore, because of regular pest control, we are fortunate that we do not experience fly swarms. Nevertheless, there are several steps people can take to stop flies from infesting. Windows and doors should be kept closed or have screens over them so flies can’t enter. Food should be covered, and spills should be cleaned up immediately so their scent doesn’t attract pests. People should also fully seal waste disposal containers and should clean up after their pets so flies do not feed off waste materials. Fly infestations are common in residences and locations which stockpile or store food. One identifying feature is the presence of a large number of flies around trash sites, which indicates there are many of them in one location. People might also notice dark spots around the ceiling or find maggots in enclosed spaces. Because they reproduce quickly and live in many places, they can be difficult to thoroughly eliminate. One of the most effective ways to remove them is by contacting licensed pest control providers such as Killem. 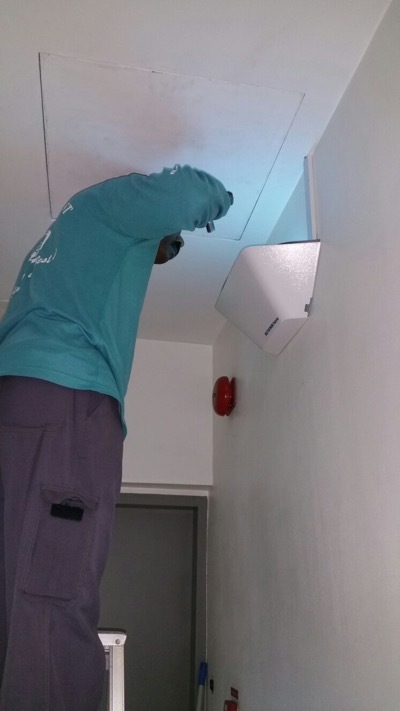 Our Pest Control Operators (PCOs) can install light traps which attract flies using energy saving bulbs. They also have the materials to perform thermal fogging and residual ULV misting. Many of our products have low toxicity and are environmentally friendly. Our Fly control PCOs also know when flies are the most active, and are adept at treating all of the areas where they might reside. When in doubt, bring the professionals like Killem out!